The better your indoor air quality, the better your health. Research shows that poor IAQ leads to coughing, sneezing, headaches, fatigue and even poor productivity and performance at work. So, the sooner you remove mold spores, asbestos fibres, VOCs and other potential threats from your air, the sooner you can start feeling better. If you're a resident or business owner in Perth, call Mold Busters for fast and professional service. We are fully certified with NAMP (National Association of Mold Professionals) and strictly follow ANSI/IICRC guidelines for safe mold remediation. 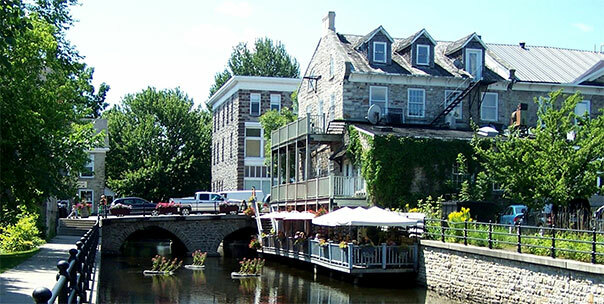 Situated next to the Tay River in Southern Ontario, Perth is about 80 kilometers southwest of Ottawa. Originally a military settlement, Perth now boasts a historical downtown lined with heritage buildings, boutiques, shops, restaurants and farmers' markets. Due to the large number of aging buildings in Perth, Mold Busters has now begun offering same-day or next-day service for mold, indoor air quality and asbestos-related issues in the area. I recently realized the relative humidity inside my Perth home is much higher than it should be. For peace of mind, I want to have a mold inspection. What can I expect? We start by visually assessing the area in question for signs of mold (e.g. discoloration, water damage, moisture intrusion). From there, we may use an infrared camera to check for temperature abnormalities behind walls, which are indicative of moisture intrusion and therefore mold. We may also collect a sample of the suspected material (via swab) or use a moisture meter to determine whether there’s cause for concern or a further need for an air quality test. The most important part of any mold inspection is locating the cause of the mold growth. And because mold is always the result of a moisture problem, our inspector will attempt to find the source of the moisture so that it can be repaired and you will be protected from future mold growth. Mold Busters offers fast and affordable mold inspections in Perth, often on the same day or next day of your call. Because service was great. Not a long wait. Tech was super nice and informative and the price was fair. Thanks for putting my mind at rest :-) Sonia D.